the nikah dress. | escaped. Last few weekends, we set up an appointment with the designer to go look for fabrics for my nikah dress. He suggested EuroModa Jalan TAR as he's their client and he always gets good deals there; and I said yes as I know practically nothing about fabrics. 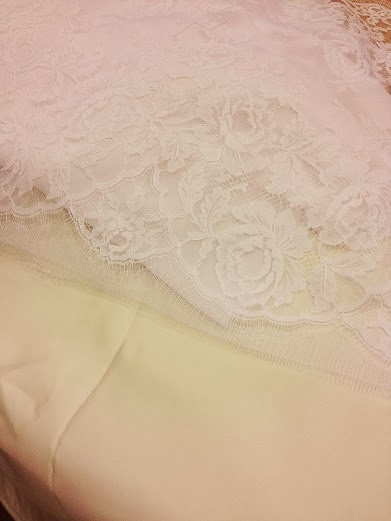 Last time when I was in Jakel, I almost paid for french lace worth thousands. So since I trust him with the selection, I didn't think twice when I see the laces he proposed. Him : why don't you learn how to sew? That would simplify things a lot. No need to pay anyone to do your dress some more, a wedding dress is definitely NOT cheap. Me : Yeah, buy me a sewing machine then. The designer showed us how my dress would be, asked for our opinion, I said yes I like the design and nodded some more. To be honest, Googling all these nikah dress design on the internet really worsened my decision-making process - I can't seem to decide which would be the one I really like and at the same time would compliment my vertically-challenged figure as the ones I tend to like are the ones with long tails which will need really long legs. But the one the designer showed me have tails and apparently I have "no problem fitting into it cause I can design to your comfort and you can wear 5-inch heels", I had to say yes. A bit nervous to see how it turns out.